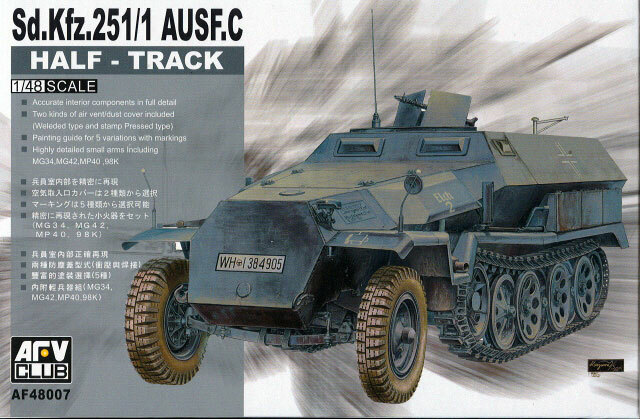 AFV Club released their 1/35 scale Sd.Kfz. 251/1 Ausf. C just about five years ago, and while there was some discussion between German fans as to whether or not this kit was better than the DML one, the point was that there were two nice new kits of the popular 251 series halftracks on the market. AFV Club now appears to be the first one to get a new 1/48 scale kit to market, and it is every bit as good as their 1/35 scale one (Kit No. 35078) was when it was released. This kit is not really pantographed down from the bigger one, even though it follows the same general layout of having the lower hull sides and suspension molded as one piece per side. This kit only has 2/3rds the parts of its big brother, but once again is nicely laid out. Using one of DML’s tricks, the road wheels are partially molded together with the rear ones linked together by “O” rings and the middle road wheels held together by arches. This speeds assembly, ensures accurate fit, and also makes for a “square” assembly job when done. Front wheels and tires are one part (which is normal in this scale) and the tracks are single-piece black vinyl. They would be more than supple in 1/35 scale but may be a bit stiff in this scale, and being vinyl will require ACC cement to fit to the wheel runs. Interior assembly is pretty straightforward and the kit comes with a total of eight Kar 98K rifles, two MP40 submachine guns, and two MG34 or MG42 machine guns. The seats are nicely done and each one consists of four or five parts. The cab has fixed visors but each visor consists of an interior section with separate frame and an outer visor cover. Even “headache” pads for the lower side of the upper cab plate (under the forward machine gun) are included. The rear doors come with complete hinging, but this is a bit thick and I am sure many diehards will wait for an etched set to provide more scale appearance. Fenders are appreciably thin, but the bins are all closed. A choice of two different styles of air exhaust vents for the engine bay are included. Decals cover five different finishing options with targeted markings (e.g. NO number jungles for the license plates); Pz.Gren.Div. Grossdeutschland, Russia 1943 (red brown/green over sand); 3rd Panzer Division, Kursk 1943 (sand); 16th Panzer Division, Russia 1943-1944 (whitewash); 14th Panzer Division, Ukraine 1942 (panzer grey); and 21st Panzer Division, Libya 1942 (sand). Overall this is a good choice, and appears to be a relatively quick built with lots of detail. Thanks to Miin Herng Tsueng of Hobby Fan for the review sample.